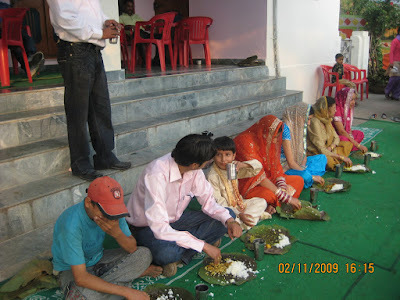 Amongst festive foods, the traditional meal, Dham (lunch served in traditional marriages of Himachal Pradesh) which consists of various cuisines served in small portions finds instant mention. Dham is prepared by boti's only who are Brahmin chefs and have been in this profession for generations. The utensils used for cooking the food are normally copper ones. The preparations for Dham begin a night before, and when ready, it is served in courses to people who sit on floor. Pattals or leaf plates are utilized to serve the food. Dishes include plain rice, Madra (Sepu badi/Mukund badi, Rajmah, White grams, Paneer etc), Palda (a curd based dish or curry), mustard based raita (Mathdi), pulses and Meethe chawal( sweet rice) or Mithdee (made of boondi, Bread crumbs etc). Dishes vary from one district to another as per local culture. Dhule maah (dhuli Urad dal) cooked in deshi ghee is specialty of Mandi Dham while Chambayali Rajmah is the specialty of Chamba dhaam and Kaale chane ka khaata (Sweet and sour sauce) of Kangri dham.